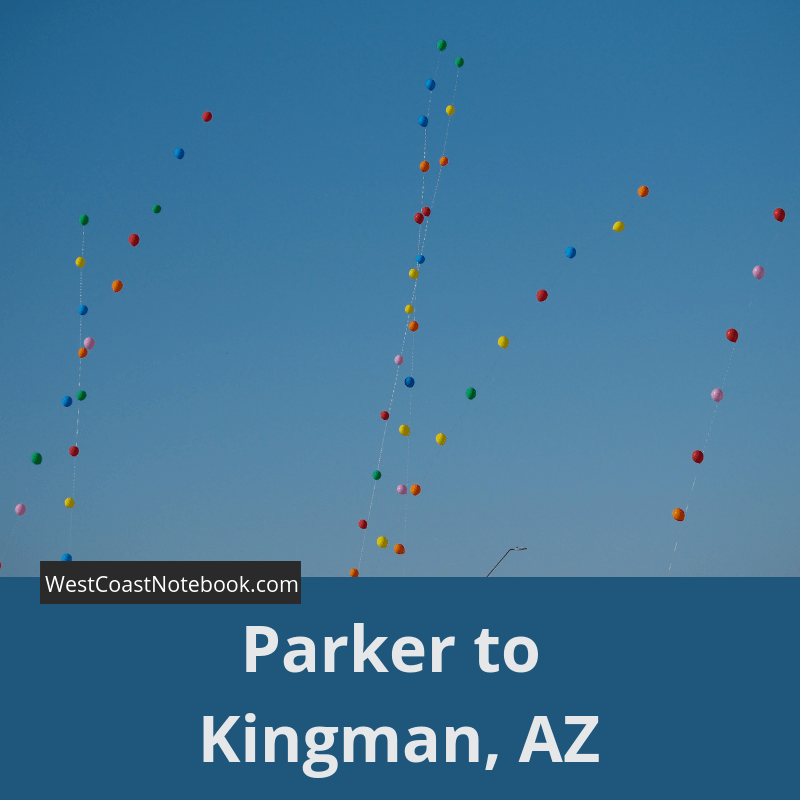 This will be a short post today as we only made it from Parker to Kingman, AZ which according to Google maps should only take 1 hour and 39 minutes. Instead, it took us the entire day. By the time it was 1 pm we had only gone 16 miles out of Parker. It started out with balloons. 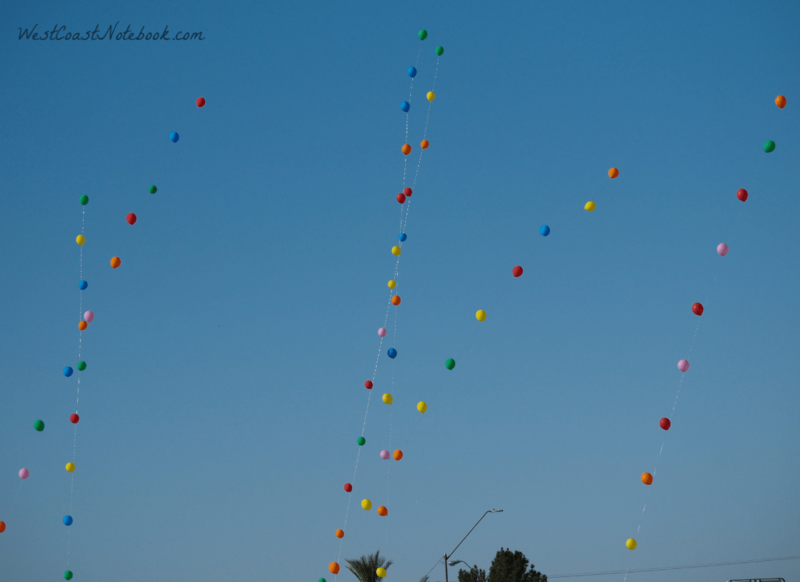 Lots of balloons in the sky, brilliant and bobbing in the breeze. After having breakfast we wanted to see if we could rent a boat so, the first place that rented them was the Bluewater Resort and Casino. Having stayed there before we knew they rented boats, but apparently, that was shut down for the weekend as they had the regatta on. So instead, we tried our luck at the casino and came out ahead $100 and had a little fun. They had a small craft fair inside the casino which was mostly native crafts and one lady did the most beautiful work with seed beads. It was meticulous work and careful planning went into her designs. I almost wish I had a need for one of her items. Leaving with our newly acquired money the next stop was a swap and shop alongside a resort that also rente boats. Turns out all the boats were rented as it’s the Thanksgiving weekend so we were out of luck again. But, we had a fun time looking at all the booths and I bought a magnetic bracelet that is supposed to help with carpal tunnel and all other sorts of aches and pains. Rob ended up wearing it for most of the day but when I had it on and started my computer, every time I put my wrist near it, my computer would shut down. Thought it would be safer. Back on the road, we saw a sign for the Parker Dam. Off we went and you can only take cars over the dam. Not trucks or RVs allowed. This got us onto the California side of the Colorado River again and it was interesting to see all the houses along the river on both sides. There must be another way to get to this side besides going over the dam as there were numerous RVs and boats that definitely hadn’t come in the same way we did. After travelling a few miles down we came back to a sign that said “Black Meadow Landing” and then below it referred to being aligned with the BLM or Bureau of Land Management. Thinking that this was a wildlife area we headed down the 10 miles to the landing. 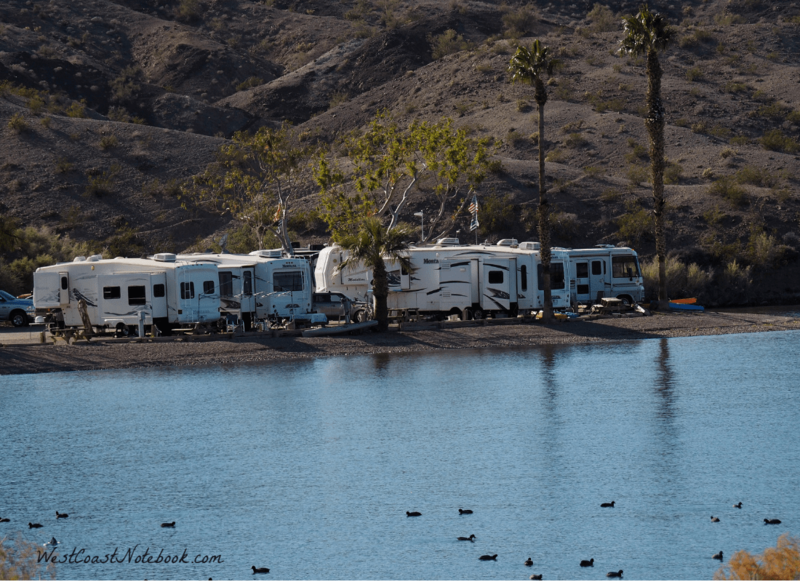 Imagine our surprise after going up steep hills and hairpin curves (paved road) and being in the middle of nowhere to pop out of the mountains onto the flats of the Colorado River into a very large RV park, motel, diner, and water resort. From nothing to downtown camping. The motorhomes were all lined up along the water and some had boats pulled up in front of them. Black Meadow Landing was very uptown with boat launches and docks and even a golf course. 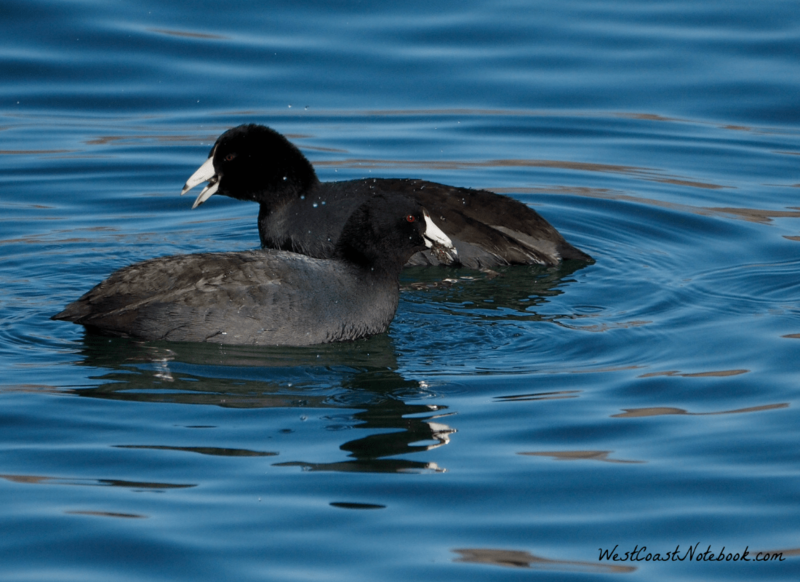 We got a half hour pass and went in and had lunch at the docks watching all the cigar boats and sea-doos go by while the coots dabbled in the shallows. Driving the 10 miles out I wondered how all those big fancy RVs had gotten in such a windy road, but they didn’t seem to have a problem with it. 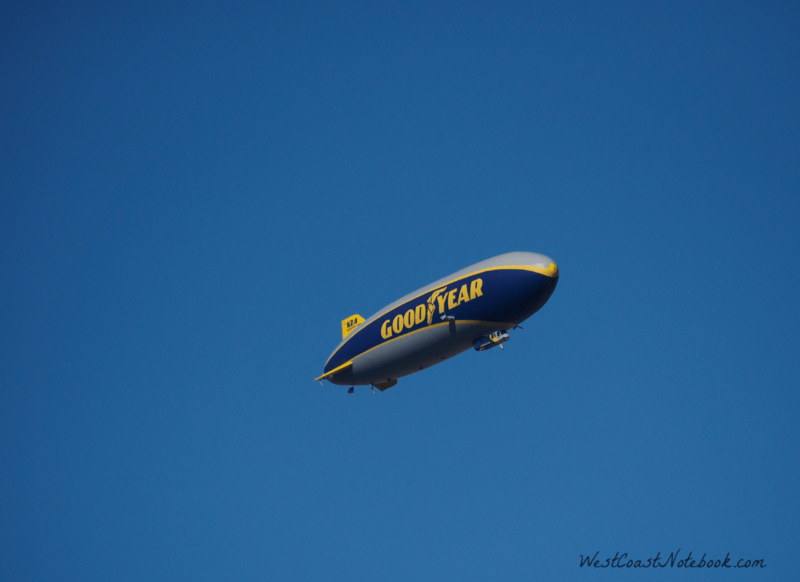 Back at the river, I looked up and there was a Good Year blimp. You don’t see one of those very often. We were now officially headed to Parker but had one more sideline along the way. 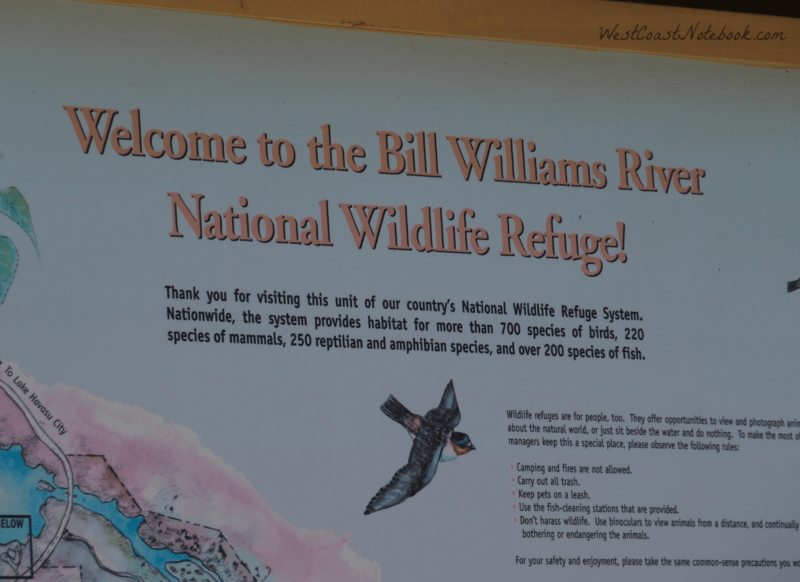 There was this sign that said, “Bill Williams River National Wildlife Refuge” that needed exploring. It appears that it is a huge area that you would need a boat to do it justice but it did have a walking trail out onto a peninsula that made great bird viewing. The very first thing I saw were two Clark’s grebe doing the dance. They came straight out of the water towards me looking like they were walking on their tip toes. I was so entranced I never got a picture and they were too far out to get a good one but I found this video just to show you what I saw. It was absolutely amazing and a once in a lifetime event. Watching them I hoped they would do it again, but they dove and went their separate ways. And so ended my birding day. We arrived at Kingman about 5:30 pm and found a nice clean motel. It’s midnight and Rob’s sound asleep and I will be shortly.